Streets Alive! is back on the Southside on Sunday, Sep 17 from 1-5 PM! Walk, bike, roll, jump, dance, play, and enjoy the last days of summer all along S Plain St from Southside Community Center (featuring the Latinos Multicultural Festival!) to Elmira Rd. We also need volunteers to make this event possible. Join our team of superstar volunteers at www.streetsaliveithaca.com/volunteer! Ithaca is recognized as "Best Small City for Carsharing in North America"
On June 26, 2013, Mayor and longtime Ithaca Carshare member Svante Myrick received an award honoring Ithaca as the “Best Small City for Carsharing,” from international CarSharing Association president Wilson Wood, of Ottawa’s transit-oriented VrtuCar carsharing service. Ithaca Carshare has over 1,300 members using 21 cars, minivans and one pickup truck. 52 responses were received for the LEP survey. Get Survey Results. Most of you are aware that the Hope Foundation put out an invitation for equity grant applications. There were to be 2 $1000 awards to folks nominated and 1 $8000 award to an organization with a great idea. Chrisophia nominated me for one of the $1000 awards after we attended a question and answer event regarding this new grant opportunity. She and I both got calls yesterday announcing that I GOT ONE OF THE AWARDS! I believe that really WE (meaning all of you I am addressing) got one of the awards. During the phone conversation Chrisophia had, it was made clear that our award reflected their pleasure that someone was tackling one of the the big, complicated, pervasive issues that trap folks in poverty. These big, complicated, pervasive problems are not suited to solving with A PROGRAM. The solutions need to be varied and will likely make parts of the puzzle better but not solve the problem as a whole. We have been picking away at the problem of helping folks get to events at school now for 7 years. I believe we have accomplished making this issue far more visible. We have folks in each school available to help (the liaisons). We are almost always getting folks to the meetings they want to attend. That there is help available is becoming known and families are starting to ask for assistance. Systemic change is noticeable, if painfully slow. I hope to use the award monies to facilitate shared taxi rides to school events from single locations such as Overlook to Enfield or West Village to Cayuga Heights or Titus Flats to Fall Creek. Are there good target locations with enough families with kids to fill a 15 passenger taxi going to Caroline or Belle Sherman? Some of you know that far better than I. More on this later, but be thinking about this as an idea to help families get to evening events or Youth Bureau Basketball or other similar activities. It is not a ton of money and will facilitate a finite set of rides, but it is a start! But for now, please join me in celebrating the fact that our work has been recognized as valuable and important – GO TEAM!!!!! The graph shows bus and paratransit ridership from 1990-2012. From 1990-1997, bus ridership includes CU Transit, Ithaca Transit & TOMTRAN, the transit systems of Cornell University, City of Ithaca & Tompkins County. TCAT began in 1998 and was re-organized as TCAT, Inc. in 2005. 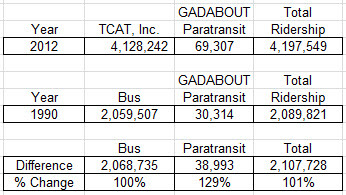 GADABOUT ridership is shown as the paratransit data. Free and Open to the Public. Door prizes. Free Popcorn to the first 75 people. * A rescreening of films from StreetFilms.org and FilmedByBike Film Festival. * A brief public introduction to the new Bike Walk advocacy group in town and plans for the year ahead. * A source of inspiration for all things bike, walk, active transportation, livable streets, open streets, healthy activity, community art, and more. * A selection of 20 great short films from around the world, and a chance to enjoy them all in good company. A Special Meeting to Consider 5310 Program Projects will be on Tuesday, Nov 12, Tompkins County Old Jail Conference Room, 125 E Court St. from 10:10 to 11:30 am. Regular November Meeting is Wed., Nov 20, Tompkins County Old Jail 10:10 to 11:30 am. Coordinated Transportation Plan Vision Statement: A collaborative effort using best practices of mobility management to coordinate human services to provide comprehensive, affordable, accessible, and seamless mobility services for older adults, persons with disabilities, persons with lower incomes, and the public at large. Our Next Meeting is on Wed. Oct. 30, 2013 at the Tompkins County Public Library, Borg Warner Room East, 100 E. Green St, Ithaca, NY., 10:10 to 11:30 am. Tompkins County is applying to the Federal Transit Administration (FTA) for $1,736,624 in Federal financial assistance under the Section 5307 Urban Formula Program. See the PUBLIC NOTICE! Click image to go to NTI website. Tompkins County DSS Transportation Planning is hosting NTI's Implementing Rural Transit Technology course on June 26-27, 2013 in Ithaca NY. Everyone should register on the NTI website (http://www.ntionline.com/courses/courseinfo.php?id=63). Course limit is 40 participants. Wed. Oct 17, 2012 at the Tompkins County Public Library, Borg Warner Room, 100 E. Green Street, Ithaca, NY., 10:10 to 11:30 am. 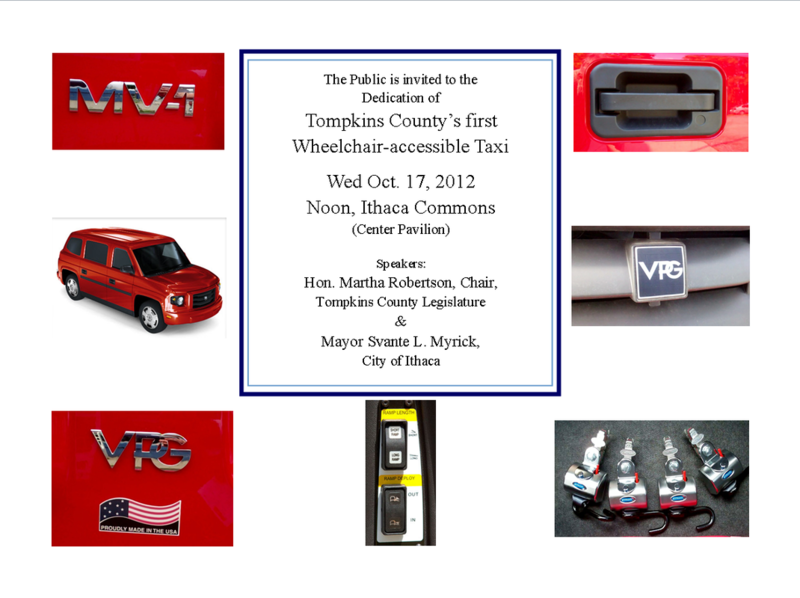 At Noon the MV-1 Taxi will be dedicated on the Ithaca Commons in front of Center Ithaca. You Helped Your Community Plan Mobility Services! 732 people took the ITNEverywhere Survey! 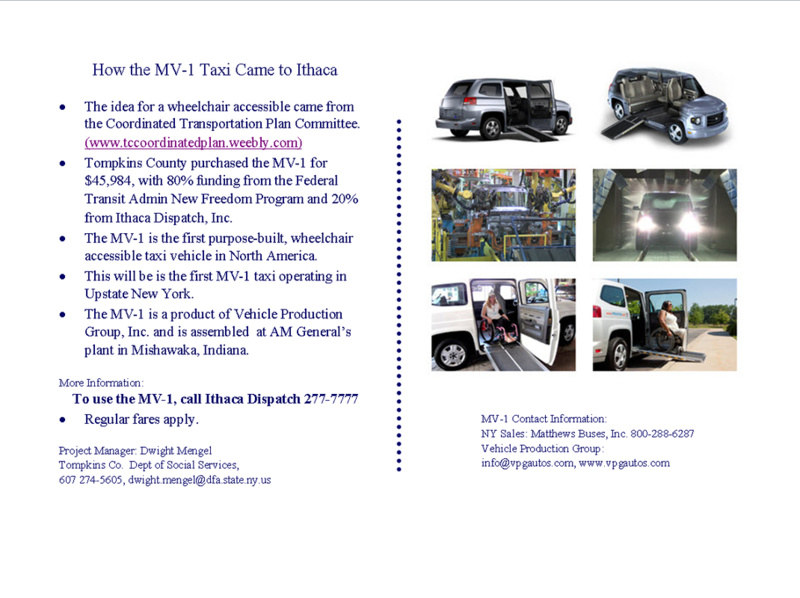 MV-1 Wheelchair Accessible Taxi is Here! The taxi was delivered to Ithaca Dispatch on August 1. Now, it is being outfitted for service. We are planning a ribbon-cutting on Oct 17, 11:45-Noon, Ithaca Commons in from of Center Ithaca. 2013 JARC & New Freedom Project Applications are due to ITCTC by July 6, 2012. On June 6, 2012, ITCTC published a notice to solicit proposals to use JARC and New Freedom funding in 2013. Proposals are due at the ITCTC office on July 6, 2012. Click this link for the Public Notice and related materials. Tompkins County is in the processof buying a MV-1 wheelchair- accessible taxi that will be leased to Ithaca Dispatch, for use in regular taxi service. Come see the taxi and go for a ride. Remember, it's a demo. Our taxi will be red and come in July! P.S. Our MV-1 is on order and is cherry red. Tompkins County proposed a $50,000 mobility management project entitled: Tompkins Senior Mobility Connections to the NCST today. The proposal can be found here. Governor Cuomo Announces Major Initiatives to Improve New York State's Disaster and Emergency Response Capabilities Feb 24, 2012. Did you miss it? You can see it again!! 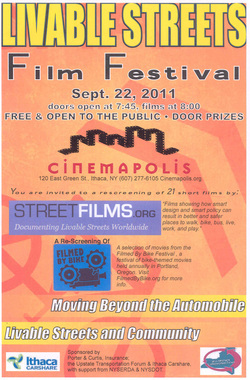 Ithaca, NY — The Livable Streets Film Festival is a free public event in downtown Ithaca presenting twenty-one short films showing how people can live and be mobile in the 21st Century by creating alternatives to conventional car culture. Drawing on examples from Portland, Oregon to Portland, Maine and places beyond, 21 short films provide an off-beat and humorous take on creating sustainable mobility and great urban neighborhoods. A local jury selected films that represent ideas that can be adapted to Upstate New York. Other films were chosen on the you-have-to-see-it-to-believe-it principle. 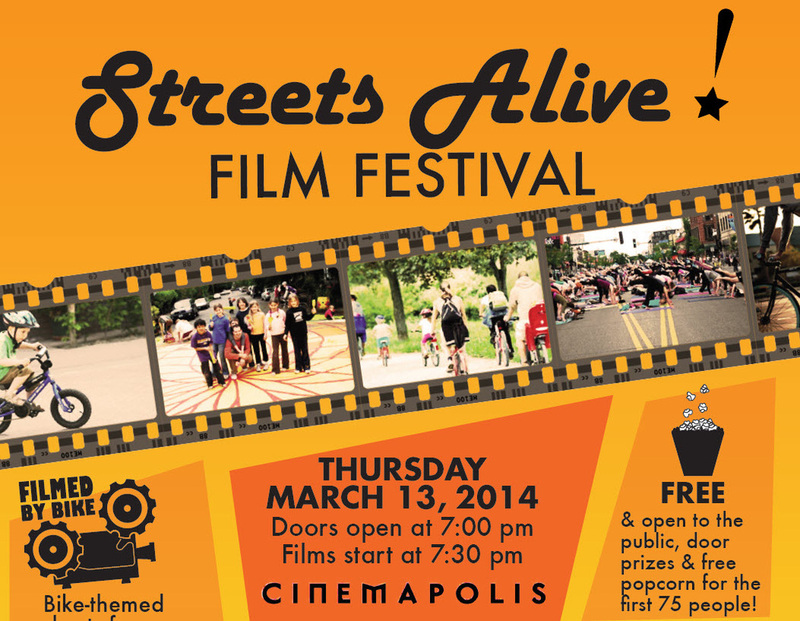 The primary sources of films are StreetFilms.org and the Filmed-By-Bike Film Festival. · StreetFilms produces short films that show how smart transportation design and policies can result in better places to live, work and play. They package complex concepts into easy to understand and accessible videos. 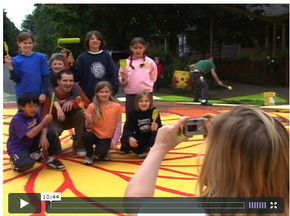 · Filmed By Bike is a bike-themed movie festival held annually in Portland, Oregon. Drawing on submissions from all over the world, the films display bike culture in its great diversity. Oct 4, 2011. Ithaca, NY. This is an update regarding the Regional Transportation Study (RTS) consultant selection. After discussions with Katherine Freund, Founder & CEO, ITNAmerica, a revised project schedule was submitted to the ITNE Steering Committee to be discussed on Monday, October 17, time t/b/a, in the Tompkins County Old Jail, 125 E. Court St.
Coming Soon! New Senior Transportation Grant Opportunity - Due December 23. I participated in NCST’s telephone conference last week and got answers to several questions I had. About 270 people were on the call. We need to pull together ideas for a proposal that fits the application objectives and criteria this week. It is clear, this opportunity is to support mobility management and not fund direct transportation services. I propose two meetings for interested people who can come. If you can make both meetings, please do. The National Center on Senior Transportation (NCST) announced a new grant opportunity very soon. Applications will be due December 23, 2011. Non-profit or local/regional/Tribal governmental agencies that plan, administer, or provide aging and/or transportation services may apply. 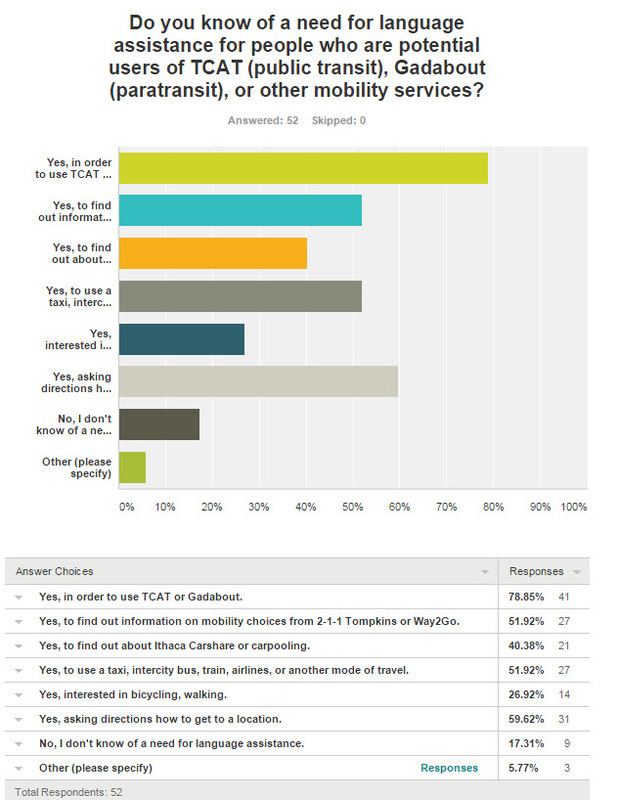 Mobility management applied to the family of senior transportation options. The NCST expects to award 8 grants, 2 in each of the categories listed above. Grants will be awarded for a maximum of $50,000. Matching funds are not required. Grantees will be expected to complete their work in approximately 9 months. The focus of all the grants is on older adults, although projects may also target adults with disabilities. A focus on culturally and ethnically diverse older adults is strongly encouraged. Older adults must be involved as key partners in the project. Applicants are also expected to work in collaboration with stakeholders in senior transportation and obtain letters of commitment from key partners. To assure that you receive the announcement of the Request for Proposals when it is issued, please sign up for the NCST e-news. Questions about this funding opportunity should be directed to Lynn Winchell-Mendy at (202) 872-0888 or lwinchellmendy@n4a.org. 4. UPSTATE Transportation Forum (Sept. 22-23, 2011) Ithaca, NY is History. The Forum will explore Here'e the link for information about the 2011 UPSTATE Transportation Forum. The program and presents will be posted to the website. The RFP has been advertised in the NY Stated Contract Reporter, the Transit Talent website, and a notice is being sent directly to a list of consultants we have compiled. Final RFP is attached. The document is posted in the ITCTC website - www.tompkins-co.org/itctc , click on Regional Transportation Study in the menu. Feel free to refer any requests for information to the web site. If you have any specific consultant you want to receive a notice of the RFP let me know, or let them know to go to the study website. A Pre-Proposal Teleconference will take place on Wednesday, July 13, 2001, 1:00pm, when I will answer specific questions regarding this RFP. Ridesharing - Tompkins Zimride is up and running! • We ask that you sign up and add your commute then Zimride will do the matching. • You can post as the driver or passenger, or say that you’re willing to do either. 3) Review your match list and start riding! Please pass this information to your employees or other networks if that makes sense. If you have any technical questions or comments about the website program contact support@zimride.com or (650) 691-5418 or see the "help" link at www.zimride.com/tompkins. For other questions about ride sharing in Tompkins County you can contact the Ithaca-Tompkins County Transportation Council at (607) 274-5570 or itctc@tompkins-co.org. 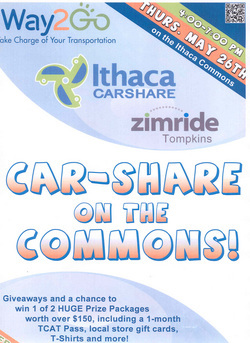 Way2Go, Ithaca Carshare and Zimride Tompkins will be featured on the Ithaca Commons on Thursday, May 26 from 4-7pm. This is a example of collaborative marketing for community mobility education, carshare and rideshare. 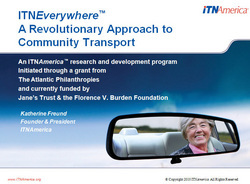 The New York State Office on Aging encourages you to attend a free webinar on ITNEverywhere®, a new approach to community transportation that has rare private funding available to plan transportation expansion in New York communities. The webinar will feature Dwight Mengel, Chief Transportation Planner of the Tompkins County DSS, who will elaborate on his innovative match of federal funding with grants from the Harry & Jeanette Weinberg Foundation currently available through ITNAmerica®. The Ithaca-Tompkins County Transportation Council (ITCTC) is soliciting proposals or ideas from the public for improving transportation services for people with low income, seniors, or people with disabilities in Tompkins County as part of the Coordinated Public Transit-Human Services Transportation Plan. Come to a pre-proposal meeting on Feb 9, 2011, 4-5 pm, at the Scott Heyman Conference Room, Old Jail Bldg., 125 E Court St., Ithaca, NY. Go to http://www.tccoordinatedplan.weebly.com or call 607-274-5605 for more information. Paratransit Dialogue starts July 26—Join the conversation! Easter Seals Project ACTION will host a two-week, online event during which transportation providers, aging services providers, and human services professionals from across the country will have the opportunity to discuss ADA complementary paratransit, human services paratransit, aging services paratransit, accessible taxi, and volunteer driver programs. Many transportation providers are experiencing challenges and seeking flexible ways to accommodate customers in a time of tight budgets and service cuts. The dialogue takes place July 26 - August 6. Join us this July to share your experiences, paratransit practices, challenges, and recommendations!Join the Online Dialogue July 26th - August 6th! National Center on Senior Transportation for the first in a series of seven calls focusing on the work of the first round of Senior Demonstration Grantees. You will learn the particulars of each project, from development to implementation and current status. There will also be opportunity to ask specific questions of the speaker at the end of each session. All calls will be from 2:00 - 3:00 p.m. EST. CityVan service between select rural and downtown locations. TCAT, Gadabout and VPSI Vanpooling services. The area’s new local ridematching program, Zimride Tompkins! How to buy, use and care for a car for less money. Tips on walking with kids, and safe, affordable bicycling. Working Families Transportation Assistance and other support services. Options for medical trips, trips to school meetings, and more. Other transportation tips, options and services. 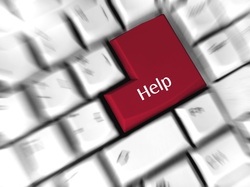 Human resource providers and other helping professionals. Community workers, organizers, and ‘go to’ people. Front desk staff, intake workers and receptionists. Educators, program leaders and event organizers. Human resources specialists and transportation service providers. Others who help people with life skills, getting around, and managing finances. Register to attend a session February 18, 2011 and receive an updated Transportfolio information binder. Choose one session: Morning: 9:30 am to12:00 pm; or afternoon: 2:00 pm to 4:30 pm. Register with Maria Christian at mjc72@cornell.edu or 607-272-2292. - Wed, March 16, 2011: Coordinated Plan Meeting, Tompkins Public Library, Borg Warner Room, 101 E. Martin Luther King Jr./State St., 10-11:30 am. - Wed, Feb 23, 2011: Coordinated Plan Meeting, Tompkins Public Library, Borg Warner Room, 101 E. Martin Luther King Jr./State St., 10-11:30 am. - Wed, Jan 19, 2011: Coordinated Plan Meeting, Tompkins Public Library, Borg Warner Room, 101 E. Martin Luther King Jr./State St., 10-11:30 am. - Dec 15, 2010: Coordinated Plan Meeting, Tompkins Public Library, Boarg Warner Room, 101 E. Martin Luther King Jr./State St., 10-11:30 am. - Nov 29, 2010: Coordinated Plan Meeting, Old Jail Conference Room, 125 E. Court St, 10-11:30 am. - Nov 9, 2010: ITN Everywhere teleconference between Steering Committee and ITN Staff,Old Jail Conference Room, 125 E. Court St., 3-4 pm. - October 29, 2010: FLIC staff is organizing a work group to address the needs of people going to and from medical appointments both in the county and out of the county. Our first meeting will Friday, October 29 from 10:00-11:30 at the Finger Lakes Independence Center, located at 215 Fifth Street in Ithaca. Anyone interested in joining this group should call Teri at 272-2433 or email flicadv@hotmail.com. - October 20, 2010: The Coordinated Plan Committee meeting is on Wednesday, Oct 20, 2010. 10-11:30 AM, Borg Warner Room East, Tompkins Co. Public Library, Green St, Ithaca, NY. Open to the public. -September 15, 2010: The September Coordinated Plan Committee meeting is on Wednesday, Sept 15, 2010. 10-11:30 AM, Borg Warner Room East, Tompkins Co. Public Library, Green St, Ithaca, NY. Open to the public. - August 25, 2010: A special Coordinated Plan Committee meeting to hear the webinar on ITN Everywhere is on Wednesday, Aug 25,, 2010. 2:00-3:00 pm, Borg Warner Room East, Tompkins Co. Public Library, Green St, Ithaca, NY. Open to the public. - August 18, 2010: The next Coordinated Plan Committee meeting is on Wednesday, Aug 18,, 2010. 10-11:30 AM, Borg Warner Room East, Tompkins Co. Public Library, Green St, Ithaca, NY. Open to the public. NOTE NEW LOCATION - THE LIBRARY!!! - July 14, 2010: The next Coordinated Plan Committee meeting is on Wednesday, July 14, 2010. 10-11:30 AM, Scott Heyman Conference Room, Old Jail, 125 E Court St, Ithaca, NY. Open to the public. 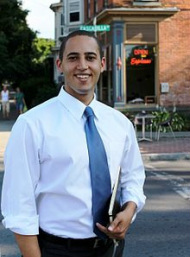 - June 22, 2010: Dwight Mengel is giving a presentation - "Creating a Mass Market for Community Mobility in Upstate NY" at the ITCTC Joint Committee Meeting, 2-4pm, Borg Warner Room, Tompkins County Public Library, open to the public. - June 22, 2010: The next Coordinated Plan Committee meeting is on Tuesday, June 22, 2010. 10-11:30 AM, Scott Heyman Conference Room, Old Jail, 125 E Court St, Ithaca, NY. Open to the public. -June 4-6, 2010: Ithaca Festival. Come to the Way2Go Depot (next to the valet bike parking). Better still volunteer to help staff the depot! Contact Chrisophia 272-2292 x184. - May 25, 2010: 10:30-Noon. Way2Go Farther & Faster Meeting. - May 20, 2010: Tompkins County submitted a grant proposal to NYSDOT to fund a coordinated travel training program for two years. 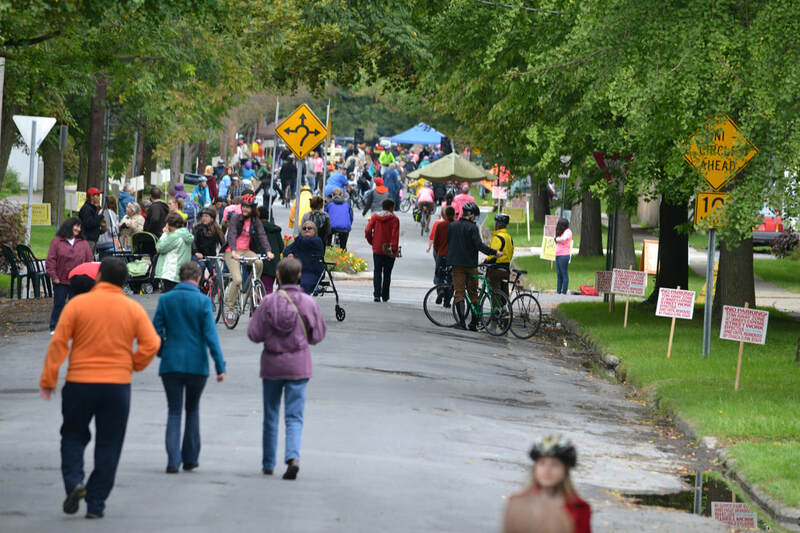 Total budget was $125,000, $100,000 FTA New Freedom funds and $25,000 from the Cornell Cooperative Extension of Tompkins County (CCETC). CCETC will coordinate the project as an expansion of its Way2Go program. -May 17, 2010: Community Travel Training Project Planning Meeting #2, Monday May 17, 10-11 am, Beverly Livesay CR, Human Services Building, 320 W. State Street, Ithaca, NY. - May 11, 2010: The last Coordinated Plan Committee meeting was on Tuesday, May 11, 2010. 10-11:30 AM, Scott Heyman Conference Room, Old Jail, 125 E Court St, Ithaca, NY. - May 3, 2010: Community Travel Training Project Planning Meeting #1, Monday May 3, 10-11 am, Beverly Livesay CR, Human Services Building, 320 W. State Street, Ithaca, NY. - April 20, 2010: The ITCTC Planning Committee approved the 2010-11 Coordinated Plan Priorities, including seven projects proposed in March and April 2009. -IMPORTANT CHANGE - April 16, 2010: Next Coordinated Plan Committee meeting is Friday, April 16, 2010, instead of Tuesday, April 13. 10-11:30 AM, Scott Heyman Conference Room, Old Jail, 125 E Court St, Ithaca, NY. - April 9, 2010: Proposals for 2010 JARC and New Freedom Projects are due to I-TCTC. 10-11:30 am, Scott Heyman Conference Room, Old Jail, 125 E Court St, Ithaca, NY. - March 8, 2010: Proposals for 2010 JARC and New Freedom Projects were due to I-TCTC. We received six proposals which can be downloaded under the March 16 meeting info. - March 1, 2010: CityVan service for Towns of Enfield and Newfield began. - Feb 23, 2010 Coordinated Plan Committee meeting #12 was held at the Old Jail CR. - Feb 1, 2010: A project/idea development meeting was held on Feb 1, 10-11 am, Scot Heyman Conference Room, Old Jail, 125 E. Court St., Ithaca NY See summary. - Jan 19, 2010: The first Coordinated Plan Committee meeting for 2010 was held. See summary.